Eddie Redmayne reprises his role as magizoologist Newt Scamander in this fantasy adventure sequel to 'Fantastic Beasts and Where to Find Them' (2016), directed by David Yates. When dark wizard Gellert Grindelwald (Johnny Depp) evades capture from MACUSA, Newt is called upon by his former teacher Albus Dumbledore (Jude Law) to bring Grindelwald to justice once again. 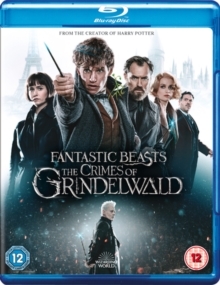 Their quest takes the pair to 1920s Paris, where Grindelwald is searching for Obscurial Credence Barebone (Ezra Miller) to help him accomplish his mission of subjugating the entire No-Maj population and leading a new wizarding order. The cast also includes Katherine Waterston, Dan Fogler, Alison Sudol, Zoë Kravitz and Callum Turner.